This open tote is perfect for quick and easy tool location. Internal and external pockets with elasticated side pocket to prevent small items falling out. Heavy-duty steel handle with ergonomic shape of grip made of foam makes lifting more secure and comfortable. Square shape support keeps the case stable and vertical to prevent any danger of spillage of equipment. 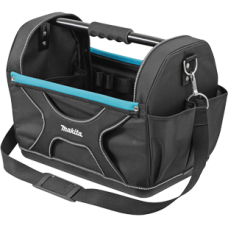 The hard wearing, leather lined interior that will protect from years of wear and tear from screws, nails and sharp fixing.Plastic bottom for maximum tool protection. Features: Reinforced sides to give maximum tool protection. Pocket on the side with elasticised band prevents your small tools and fixings from falling out giving you safety storage. Open design for quick tool location.